HAS YOUR TRAVERTINE LOST ITS LUSTER? “Travertine Limestone” and “Travertine Marble” are the same stone. They are characterized by winding, irregular holes in the surface, with the flats finished to varying degrees of smoothness and reflectivity. “Shell Stone” is another type of this same material with shells embedded. Travertine has undeniably become more and more popular in the past few years. With that popularity there have been corresponding problems. Some relate to installation, while others are an inferior grade of stone and there remains the ever present failure to use the proper stone cleaning process and product. The characteristic voids in Travertine and Limestone were caused by gases present when the rock was in the molten state. These voids appear as holes in the tiles and are either filled during the filling process or at the Factory. Peak Floor Solutions restoration process may involve filling an entire floor or random tiles that have these voids. The fill is either a form of grout or an epoxy resin filling. Our craftsmen also perform crack repairs, grout repairs, grout restoration for soiled grout all of which is done based on the level of restoration your particular surface requires and the finish you desire. Peak Floor Solutions uses the latest state-of-the-art equipment, diamond abrasives and other tools to restore your surfaces to like new again. Travertine cleaning has never been better! Our travertine cleaning process typically involves the use of our hot water extraction unit along with quality surfactants providing the most effective cleaning method for your stone. Effective and thorough cleaning is crucial for a smooth looking uniform finish and proper sealing. Providing a neutral pH surface is our goal. When the surface is kept in a neutral state you will notice that the surface will stay cleaner for a greater period of time. When the project is finished we provide you with the proper knowledge to keep your floors in terrific shape! 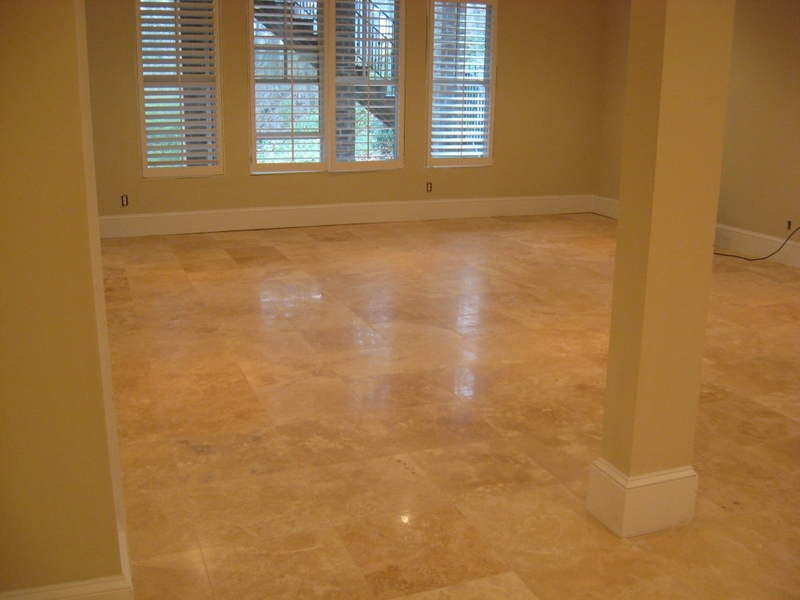 We relish our client’s “Aha Moment” when they see their fresh clean travertine tile floors. All of the pits and voids in the travertine will be pressure cleaned then dried resulting in a sparkling clean floor. Honed? What is that? Usually it is the description of the tile when purchased from the tile store. It varies from a low hone (no reflection) to a borderline polish (closer to a marble), all in the same description! Typically a honed floor will reside at the 400 grit diamond level producing a pleasant medium sheen. Depending on the type of tile and type of fill from the factory, achieving a medium honed finish is where we step in and use our training and knowledge to your benefit. Every floor is different and we take pride in being efficient with a game plan that will give you the desired results. Use our training to your advantage! Do you have polished travertine or limestone? Whatever your need is, Peak Floor Solutions has the training and experience to polish your travertine or limestone. Using diamond abrasives, or compounds we achieve a very clean, highly reflective, shiny finish. The shine intensity can range from a honed (more of a matte finish) to a custom medium shine to a very mirror like high gloss finish. The amount of fill, open pores, blade marks will affect the shine uniformity especially when going with shinier finishes. We use the finest abrasives to achieve the glossiest finish possible for your stone. This shine is like turning your floor into a work of art, something to be noticed as much as the art on your walls. We use high grade penetrating (impregnating) solvent based sealers to seal your travertine and limestone surfaces. Their function is to absorb into the pores of the stone and fill them up. Polished travertine does not require the sealer that a lower honed stone will. Tight pores help keep spills on the surface so they will not soak in. Stones that require sealing will be protected from color transfer and not the resulting acid etch that will most likely occur from acidic drinks or products. Common liquids containing acids are: Citrus, vinegar, wine, soda, some perfumes and medicines. Using the highest impact abrasives (lowest grits) this method is designed to remove a measurable amount of stone. Uneven tile edges (lippage) can be evened out using this method. Depending on the density of your stone and severity of lippage, our grinding process and state-of-the-art machinery is the most efficient available. Floors that have been flattened present a floor like most seen in Italy, monolithic in nature. Travertine, Marble and Limestone are all subject to etching. Etches are a dull spot on the stone. Mostly caused by spills containing any type of acid: Citrus, wine, alcohol, vinegar, pet accidents are all acidic in nature. Acid eats calcium carbonate found in these stones and the result is an acid etch. The natural chemical reaction is almost immediate and can vary in severity depending on acid level, how long it sits, and the size. Penetrating sealers guard against color transfer but not acid etching, they can minimize the damage caused but they will not prevent it all together. Give us a call today at (770) 499-1151 or click here to receive your free, no-hassle quote for service.